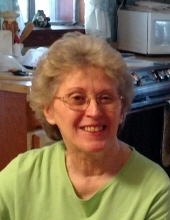 Sandra Bell, age 70, of Tomah, Wisconsin, passed away Wednesday, January 30, 2019, at the Tomah Healthcare Center. She was born October 22, 1948, to Theodore and Laurene (Lawrence) Gebczyk in Sparta, Wisconsin. She was an avid reader and adored her cats. She is survived by her husband, Alexander of Tomah, WI, step-sons, Andrew Bell and Ernest Bell and their families, her siblings, Jackie Sullivan of Marengo, IL, Ted Gebczyk of Centralia, IL and Gail Dvorak of Tomah, WI, an uncle, Ronald (Nancy) Lawrence of Camp Douglas, WI. She is further survived by nieces, nephews, other relatives and friends. She was preceded in death by her parents, Theodore and Laurene, a brother, Kevin, and a brother-in-law, Carl Dvorak. Memorial services will be held Friday, February 8, 2019, 5:00 p.m. at the Torkelson Funeral Home. Pastor Bob Streeter will officiate. Family and friends are invited for visitation on Friday from 4:00 p.m. until the time of service at the funeral home. In lieu of flowers, memorials may be given to Chasing Daylight Animal Shelter, 15560 WI-131, Tomah, WI 54660. The Torkelson Funeral Home of Tomah is assisting the family with arrangements. Online condolences are available at www.torkelsonfuneralhome.com. "Email Address" would like to share the life celebration of Sandra Bell. Click on the "link" to go to share a favorite memory or leave a condolence message for the family.